Today I have 2 young cousins that are in Waikiki. They’re first cousins and didn’t even know that the other would be there too until their mothers informed them today of their posts that they read on Facebook! One is there for the Honolulu Marathon Week festivities and the other is just there for a short stopover before she heads for a much-needed 3-week vacation to be with her Mama, who lives on Kauai. Of course, this reminds me of a myriad of fabulous memories and events that I’ve enjoyed in Waikiki throughout the past 40 years, but thinking about the Honolulu Marathon being run tomorrow makes me think about my own WAIKIKI CHASE that occurred 26 years ago. The photo above is an aerial photo that was taken recently of Waikiki but the shoreline is basically the same, although the sandy beach area in front of the Sheraton Waikiki isn’t nearly as expansive as it used to be. The 2 red stars that I have placed on this photo are the beginning and end points of this ‘chase‘. When my (now ex) hubby was stationed on a ‘remote’ tour-of-duty on the Arctic Circle in the very northern part of Canada, the USAF sent the 3 children and I to Oahu for 14 months to be near Hickam Air Force Base. We assumed this would be our next assignment. It didn’t turn out to be so, Hurlburt Field in Florida’s Panhandle did, but that will be for another story. Our favorite activities were going to the beaches and to the zoo. Luckily, the beaches are free and we had an annual pass that included both the Honolulu Zoo and the Waikiki Aquarium. My daughter loved watching clams and anything else that’d make it’s way into the sand, and running after the birds. My youngest son had his most fun building sandcastles. My oldest son played in the water and chatted with the tourists. That’s one of the main reasons that I usually chose to frequent the beaches with the lifeguard stands….because my 3 kids were ages 5 and under. We always took a cooler to the beach with our sandwiches and drinks. I kept my wallet in the bottom of this cooler for safekeeping so that I’d not have to have a purse to sling over my shoulder every time the kiddies and I wanted to go into the water. We had a lot of ‘stuff’ that we took to the beach: beach towels, hats, sunblock and suntan lotion, aloe, 2 pairs of sunglasses for each of us, boogie boards, slippahs (flip-flops), assorted items to build sandcastles with, pails and shovels, cooler, bandages, and even an extra swimsuit for each of the kids. I had a couple of big cloth bags that fit all of this stuff and it fit into the trunk of my car. Our car always had this ‘beach kit’….ready for anytime that the mood struck us to ‘hit the beach’! On this particular day, we were eating lunch at the Ft. DeRussy Beach, which is the military beach at the western end of Waikiki. My daughter started chasing a small flock of birds. I called to her but she didn’t hear me. The wind picked up and she kept running, so I grabbed a boy in each hand and took off after her, leaving ALL of our belongings behind. Every time we got close to her, I’d call out to her but she didn’t hear me. She was 3-years-old and her only thought was to run and laugh as she chased those birds! She was having a blast while the boys and I were barely able to keep her within our sight! The tourists paid no attention and I don’t know why it didn’t occur to me to ask a lifeguard for assistance. All I could think of was to get to my baby girl! We FINALLY caught up to her at the eastern end of Waikiki near the zoo. We’d run a total of 1.8 miles in the sand! My 5-year-old son caught her first and we all collapsed into the sand, exhausted. That’s when I realized that I didn’t want to make that long and tiresome trek back. I suddenly remembered that all of my belongings, including my wallet and keys, were almost 2 miles away. I decided to beg for a ride so that’s exactly what we did. I brushed off as much of the sand as we could, and then we went to the road, where The Bus comes along every 10 minutes. I was extremely thankful that the very first busdriver believed my story and let us ride for free! When we got back to Ft. DeRussy, I was relieved that our stuff was still in the same spot where we left it. I was nervous as I stuck my hand down into the cooler but my untouched wallet and keys were actually there too! We gathered everything and walked to the car. Of course I made the kids pay extra attention to the long path as I drove along the exact route that we’d taken as we ran that 1.8 miles during our WAIKIKI CHASE!!! We were very tired when we got home but the ‘lecture‘ was minimal. My daughter never did catch those birds. She still tries though. She’s studying to be a Biologist with hopes of getting a Master’s degree in Zoology. Guess what? She DOES HAVE a special place in her heart for birds too! Hmmm, maybe it started when she was about 3 on a beach somewhere in Hawaii! Mama always said that once I had kids, then I’d learn to become a MORNING PERSON….well, the oldest kid is 32 now so I reckon that if it’s not happened by now then IT AIN’T HAPPENING! Oh sure, I do enjoy the occasional sunrise but mostly I’m a person that’d rather sleep late and stay up late. Always have been and always will be. I live precisely in the middle of the state of Florida. The tourism marketing folks claim that we’re 45 minutes to the Atlantic Ocean and approximately an hour to the Gulf-of-Mexico. That’s quite an exaggeration. My house is on the eastern end of Kissimmee, away from the theme parks, and it still takes me much more than an hour to get to the nearest Atlantic beach. If I wish to drive to the most beautiful beaches, which are the dazzling sugar-white sandy beaches west of the Tampa area….it’ll take from 90 minutes to 2 hours of drive-time because of the dreadful traffic and seemingly never-ending road construction which winds through Tampa. It’s worth doing it anyway because the beaches and sunsets over the Gulf rarely disappoint. Once-in-awhile I will have an opportunity to spend a night someplace along the Atlantic Ocean. This is blissful for me and I always will leave my balcony door at least partially open so that I can smell the saltiness and can hear the sounds of the waves as they come-and-go, come-and-go. Other than music and the sounds of children’s laughter, this is surely my favorite sound. I sleep well whenever I’m near the ocean. Yes, I do have one of those ‘sound simulators‘ that imitates the sound of the waves upon the shore….this does assist in helping me to fall asleep during the rest of the year but it’s a sad substitute for the real thing. 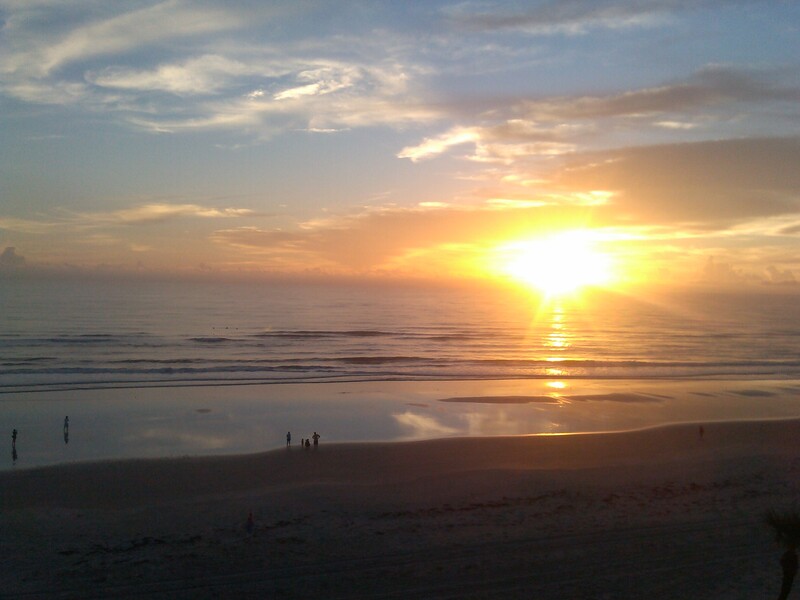 The photo above was taken the last time that my daughter and I had a weekend getaway in Daytona Beach, 90 minutes to the northeast, and sat on our hotel balcony viewing the sun as it greeted the new day. EVERY time it makes me long to live by the seashore again. We moved from Jax Beach 10&1/2 years ago to come to central Florida to become Disney Castmembers. All in all it was a good move, but I do very much miss our apartment that was directly across the street from the beach. I miss falling asleep to the sounds of the waves and our tinkling wind chimes as the ocean breezes would play with/through them nearly all the time. Walking our American Eskimo dog along the beach (after 5pm as per the law) every evening was a special pleasure for the children. I’ve also lived near the Gulf of Mexico, though not as close to the actual beach. When my oldest son was in 1st grade and we’d just returned from Hawaii, my husband got stationed at Hurlburt Field (USAF) by Ft. Walton Beach, which is in Florida’s Panhandle. That was an astonishing place to live and the beaches there were the most spectacular of all. Our favorite was the Officer’s Club Beach near Destin and we visited once or twice weekly, along with picnicking. After having having just lived more than a year in Hawaii, my children were already ‘beachbunnies’ and still were wanting to be at the beach more than anyplace else that I could take them to play. I’ve lived on the island of Oahu a couple of times, so that means I’ve also lived near the Pacific Ocean too, both with and without children. I have frequented all of the kid-friendly beaches dozens of times and also have patronized beaches where I’d not dare to take my kids! So I’ve lived on an island, where I could see the sunrise on one side and go to another side for a sunset….and I did that often. Now I live in a state that’s mostly geographically just a great big peninsula. I reckon I could watch the sunrise over the Atlantic Ocean in the morning and then cross the state and watch a Gulf sunset in the same day. But I don’t. I go to beaches on both sides but, alas, on different days. I still don’t like mornings so if I do go to the beaches at Cocoa or Daytona or Melbourne, which are MUCH quicker to get to, it’s gonna be late morning or noon-ish. But I do witness plenty of awe-inspiring sunsets, even though I have to fight traffic to get there, over at or near the more splendid beaches of Clearwater or St. Pete or Honeymoon Island. Come to think of it, if I ever bought a waterfront condo or home, I’d rather it be on the Gulf of Mexico because it’s just sooooo much more gorgeous. But real-estate prices and taxes also reflect that plus I’d get lots bigger condos (more square footage) for half the price on the Atlantic side….hmmmm, maybe that’ll be what it’ll ultimately take in order for me to become a MORNING PERSON after all! If I lived at the ocean again, I know that I’d not take it for granted because I like watching the sun come up. Maybe I’d better think about this! My First-Born child also has the honored position of being the First Grandchild for my parents, as well as for my Step-Mom. He loves this distinction! However, my Step-Dad already had 2 grandkids by this time but they live in South Carolina so he only saw them a couple of times annually. He had lotsa fun being GrandDad too. My son never got to know his ‘other’ biological grandparents….the grandfather had been killed by a tornado more than a decade before and the grandmother had been extremely ‘broken’ by this same tornado so she wouldn’t have known him anyway. But since both of my parents had remarried and lived in the same small town, which was approximately 40 miles from where my baby boy and I lived, he still had two sets of grandparents and a set of great-grandparents to dote on him! I had to live in a larger town, near Purdue University, for my travel agency job but every Friday after work we drove to either my Mama’s or my Daddy’s house for the weekend and had a grand time! All of my children have/had special relationships with each grandparent/great-grandparent. 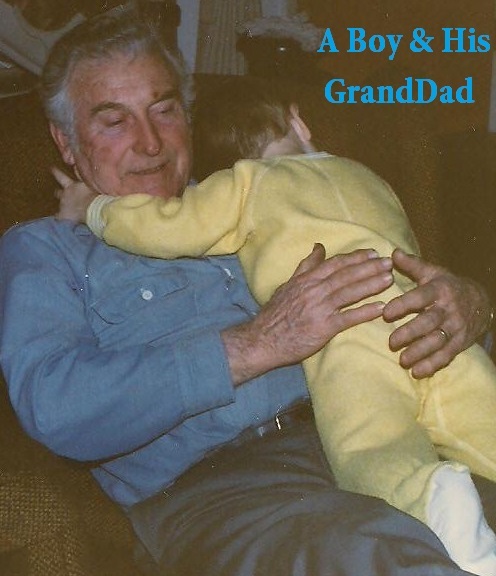 For nearly the first couple years of his life, my son turned into his GRANDDAD’S BUDDY. Whenever we were at Mama’s ‘little round house out in the woods‘, every time I’d turn around, my Step-Dad had that baby laying on his tummy watching TV or reading to him or even taking naps with him! My parents divorced when I was in my early twenties. Don’t ever believe the old adage about divorce hurting the children less if the parents wait until those kids are grown-ups. It’s just not true. My world turned totally upside-down even tho I was in college. I ran away, literally, to finish my college studies as far away from my small Hoosier hometown as I could get. My parents informed me of their decision in July and less than a month later I was attending a small Catholic college in Honolulu. That was as far away as I could get and still be on American soil. After college I returned to Indiana but not to the same small hometown. Instead I moved to the larger town 40 miles away where I could obtain work. As it turned out, I married an Air Force Officer and we had assignments in Texas, Hawaii, and Florida before my husband decided that he didn’t want to be married anymore. So it was back to this small Hoosier hometown that I took my 3 children and our broken hearts so that we could feel the love of family surrounding and comforting us once again. My parents, even tho married to others, cooperated together to pave the way by finding a suitable house for us to rent and basically made the decisions for me at a time when my distraught mind was unable to function. My Daddy and my brother brought a moving truck to Florida and literally picked us up and got us and took us HOME, while Mama was busily getting things ready in Indiana. I do not even recall registering the kids in school and doctors and many other things that needed to be taken care of so I’m sure that my wonderful parents must have had a hand in taking care of a lot of the things that I didn’t even notice but am totally grateful for. It was a good move and a good idea. Sometimes in life a person has to trust in the wisdom of those who have lived life and already made mistakes because they are able to give advice, should anybody care to listen. My parents are a perfect example of this. I may not have always agreed with them but they wanted what ultimately was best for their grandbabies. Of course I’m sure that it was wonderful for them to be able to finally attend the various schooling and scouting and church functions with their grandkids too that they’d been missing out upon because we lived in other states! They certainly did! It worked out fine. My Daddy and Step-Mom lived out in the country so that was fun for the kiddies. Daddy enjoyed coming into town and taking the 3 of them, or sometimes each one at a time, to do things or to go places. He even took my boys to his own barber and filled in when my daughter needed him for ‘Daddy Date Night‘. My Step-Mom always knows exactly which foods are the favorites of each family member and makes it a point to prepare everybody’s favorite. She’s kinda like ‘the cheerleader‘ of the grandbabies! Mama and my Step-Dad had moved a couple of blocks from the Elementary School so it was fun for the kids to be able to ask if they could walk to Grandma’s after school a few nights each week, where they knew that she’d have home-baked goodies awaiting! Their Great-Grandparents lived across town near the shopping area and we visited with them a few times weekly. It was a very good 4 years that we lived in that area, having all those grandparents nearby gave my kids the love and stability that had been lacking when we’d been moving around the country going from Air Force base to Air Force base! For some reason, probably just because he’s the oldest, my Step-Dad seemed to like to teach my first-born kid lotsa stuff. Perhaps it was because he missed his own grandkids, which by now he had 4. Or perhaps it was because he reminded him of his own son at that age….they both are stubborn loveable blondes with really big eyes! My Step-Dad was a ‘tinkerer‘, always fixing or improving something, often to my Mama’s frustration. That’s how my son became his GRANDDAD’S BUDDY….my Stepdad and my boy took apart 3 junk mowers and built 1 mower rather than buying a new one. They built a model airplane and worked on other projects that always kept my Step-Dad busy. I think that sometimes he was just looking for an excuse to ‘borrow’ my kid even tho he said that he wanted to teach him something! My Mama and my Step-Dad also invited my son to watch EVERY Chicago Bulls basketball game on TV at their house, complete with carefully planned favorite snacks. My other two kids showed no interest in sports so this was a special memory for my son. He still watches basketball and is a big fan of the Chicago Bulls. He also has turned out to be a ‘tinkerer‘ too, always finding projects to work on! Yep, that’s my boy! I’m sure that my Step-Dad is watching this young man, GRANDDAD’S BUDDY, from heaven with a twinkle in his eye! Meeting and seeing celebrities has been a part of my life since the late 1970s when I attended college in Hawaii. A decade later when I returned to Oahu as an Air Force Officer’s wife with 3 very young kiddies in tow, I’d had many opportunities to teach them that celebrities have lives other than those that are portrayed on TV. We saw sooooo many celebrities that it seemed rather commonplace, especially since Hawaii is a popular vacation destination for them too. I’m thinking this is the reason that my children don’t particularly ‘go nutso‘ whenever they see somebody famous nowadays. This is a good thing because now they either are, or have been, Disney Castmembers and are once again seeing dozens of celebrities. I taught my kids not to pester famous folks for autographs (unless it’s a book signing, for example) or for photos because these people are only hoping to have an enjoyable vacation experience like everybody else! And to think that, for them it all started more than a quarter-of-a-century ago with my daughter and her ‘kiss‘….a MAGNUM KISS to be precise! I took my children to the beaches of Oahu almost on a daily basis. There were numerous beaches to choose from so we liked to explore different areas and tried to find some of the quieter beaches. Of course we adored the ever-popular Waikiki Beach but my kiddies had a tendency to get away from me quickly there since the beaches were crowded and the children were ages 2, 3, & 5 and very quick. We also tried to go as early in the morning as possible so as not to get too overly pink; besides, the tourists were mostly still kinda hung-over from partying the night before and didn’t usually start arriving until 10:30 or later. By noon Waikiki & Kaneohe beaches are packed. So earlier was better for us. A breakfast picnic on the beach was fun and lovely! One perfect morning we were at a particular beach, which shall go nameless for the sake of celebrities that enjoy the privacy of this stretch of beaches. I knew of several celebrities that lived in the area because of a former college job that I’d had delivering floral bouquets. So I sometimes brought the kids to this beach because it was usually very quiet and we were often the only ones there! But that morning there was a couple strolling far down the beach and my 3-year-old daughter saw them and recognized HIM before I did. 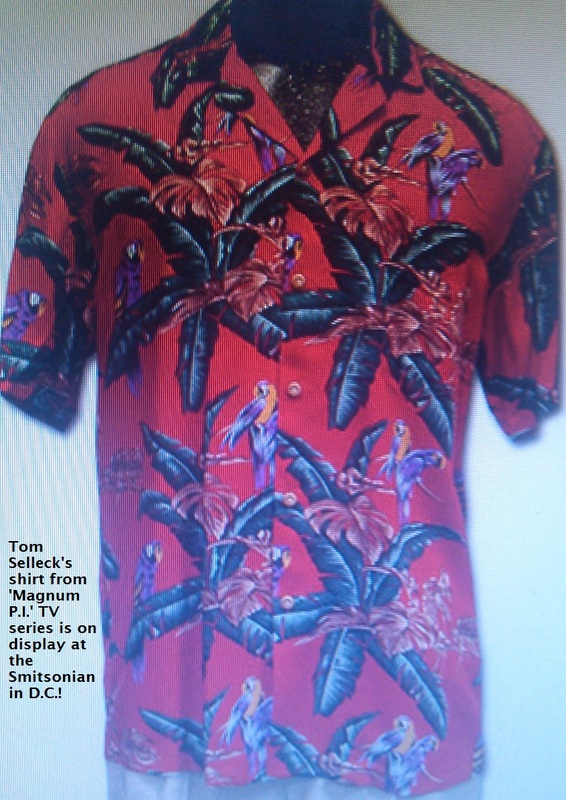 She jumped up and started running down the beach towards them, hollering “Magnum, Magnum, Magnum!”. (she was too young to understand that he wasn’t actually named that in real life) I was embarrassed but had no choice but to leave our things, grab a hand of each of my boys and start running after her! We 3 were so much slower than she was by herself. Of course, by the time we finally caught up, she’d already made her way to ‘the man from the TV‘ and his then-girlfriend Jillie. So there I stood, face-to-face with THE HEART-THROB of the decade, apologizing profusely to Tom Selleck and his girlfriend while he held my daughter and acted like he honestly didn’t mind! Tom and Jillie were the nicest, sweetest people and were extremely kind to my 3 children as we chatted for 20 minutes or so. My daughter didn’t wanna let go of him but he kissed her cheek and she giggled….probably his mustache tickled! That was a memory-of-a-lifetime for her! Me too! Oh, and by the way….my daughter’s name is Jillian. She’s always liked her name. Sometimes we call her Jillian, and often she goes by Jill. But you’d better believe that after meeting ‘Magnum’s girlfriend‘ that my 3-year-old preferred us to call her Jillie for about a year after that encounter. She was as much enthralled with Jillie Mack as she was with Tom Selleck! For MANY years afterwards, we’d ask her: “Where did MAGNUM KISS you?” and she would always coyly point to her cheek and smile. Such a precious memory to have her very first non-family-member KISS be from such a handsome man! Aaahhh….could I possibly have been jealous of a 3-year-old?